The year is 2018, and on Friday, March 16th, Grindstone is at the Rutland Arena, setting up a table as part of the Alley’s Angels Tournament of Hearts. As the table is being set up, a young girl quietly approaches, carrying a large Toronto Maple Leafs duffel bag stuffed with hockey gear on one shoulder and a hockey stick in the other hand. She proudly wears a grey hoodie that says “Hockey” across the chest. She introduces herself and says she’s here to help out before her game starts in a few hours. Meet Johanna, an aspiring hockey player and Grindstone Award Foundation’s very first grant recipient. Back in 2015, when the Foundation was in its infancy, Johanna, then only 10 years old, received the first and only grant of that year. Her dad Anthony says that 2015 was a tough year for the family and admits that without the grant, she might not have gone down the hockey road and built meaningful relationships along the way. 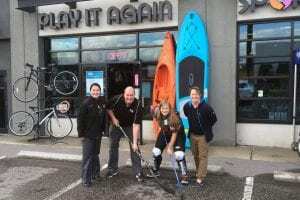 A year later, Johanna also received a much-needed full gear set from Play It Again Sports, allowing her to continue play hockey for another season. Amidst attending school and hockey practices, all the money Johanna makes through babysitting and other odd jobs goes into her hockey fund. “Hockey is the only thing I like doing,” she says with a big smile on her face. Johanna’s parents agree that hockey has had an incredible impact on Johanna. Her mom Tina shares that Johanna has always been shy and a bit awkward, but when on ice, all that vanishes. Her parents have noticed that ever since she discovered a passion for hockey, Johanna has become more outgoing and finds connecting with her teammates and other people to be less of a hurdle. As Johanna pursues her hockey dreams, she has experienced first-hand how the sport has not only allowed her to celebrate achievements on ice but has also changed her social life and given her more confidence in herself. “It [hockey] gave me more social skills, because you have friends there,” says Johanna. She adds that she finds everyone to be friendly when she plays hockey, because the girls have something in common—the love for hockey. Her parents find Johanna to be an incredible and strong-willed girl and are proud to see her on ice. Her dad has noticed that she has good hands and good hockey IQ, something that comes naturally to Johanna. The Foundation has followed Johanna’s growth as a hockey player and person since meeting her first in 2015. 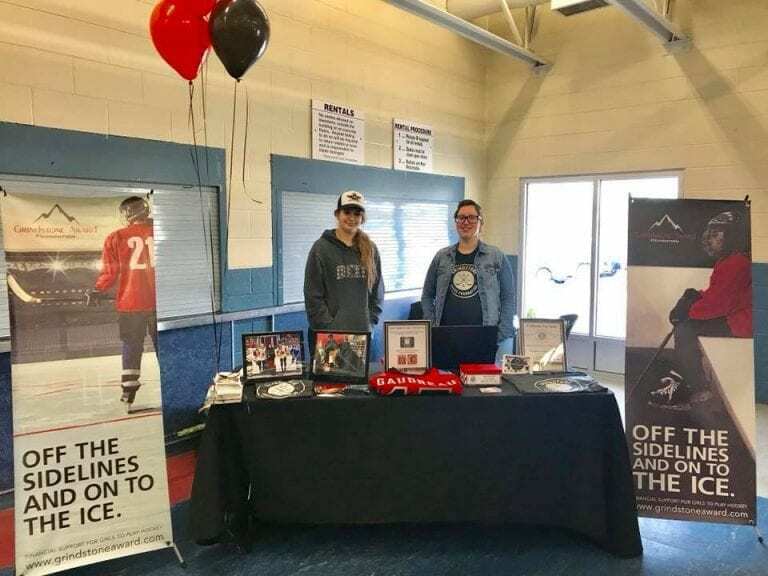 In these three short years, Johanna has become a part of the Grindstone family, volunteering at events whenever she can and helping make the voice of female hockey even stronger. We have seen her step up to the game and conquer her place in the world, all while becoming a role model for other hockey players who experience social and other struggles. As a national charity, Grindstone Award Foundation is now capable of helping more than just one player per year. Last season the Foundation was able to give out 10 grants nationwide to enable young female hockey players participate in the game. But for the Grindstone team, Johanna and her family will always have a special place in our hearts. Thank you Johanna, Anthony, and Tina for sharing your story and for being such amazing spokespeople for female hockey and Grindstone.